Baker, J.T., Dillon, D.G., Patrick, L.M., Roffman, J.L., Brady, R.O., Jr., Pizzagalli, D.A., Öngür, D., Holmes, A.J. (in press). 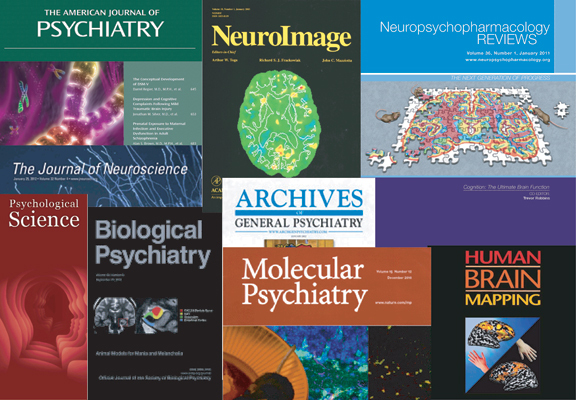 Functional connectomics of affective and psychotic pathology. Proceedings of the National Academy of Sciences of the United States of America. Bartlett, E.A., DeLorenzo, C., Sharma, P., Yang, J., Zhang, M., Petkova, E., Weissman, M., McGrath, P.J., Fava, M., Ogden, T., Kurian, B.T., Malchow, A., Cooper, C.M., Trombello, J., McInnis, M., Adams, P., Oquendo, M.A., Pizzagalli, D.A., Trivedi, M., Parsey, R.V. (in press). Pre- and early-treatment cortical thickness is associated with SSRI treatment response in Major Depressive Disorder. Neuropsychopharmacology. Kaiser, R.H., Snyder, H.R., Goer, F., Clegg, R., Pizzagalli, D.A. (in press). Attention bias in rumination and depression: Cognitive mechanisms and brain networks. Clinical Psychological Science. Krystal, A.D., Pizzagalli, D.A., Mathew, S.J., Sanacora, G., Keefe, R., Song, A., Calabrese, J., Goddard, A., Goodman, W., Lisanby, S.H., Smoski, M., Weiner, R., Iosifescu, D., Nurnberger, J., Szabo, S., Murrough, J., Shekhar, A., Potter, W. (in press). The first implementation of the NIMH FAST-FAIL approach to psychiatric drug development. Nature Reviews Drug Discovery. Sperl, M.F.J., Panitz, C., Rosso, I.M., Dillon, D.G., Kumar, P., Hermann, A., Whitton, A.E., Hermann, C., Pizzagalli, D.A., Mueller, E.M. (in press). Fear extinction recall modulates human fronto-medial theta and amygdala activity. Cerebral Cortex. Tan, A., Costi, S., Morris, L.S., Van Dam, N.T., Kautz, M., Whitton, A.E., Friedman, A.K., Collins, K.A., Ahle, G., Chadha, N., Do, B., Pizzagalli, D.A., Iosifescu, D.V., Nestler, E.J., Han, M.-H., Murrough, J.W. (in press). Effects of the KCNQ channel opener ezogabine on functional connectivity of the ventral striatum and clinical symptoms in patients with major depressive disorder. Molecular Psychiatry. Ulke, C., Tenke, C.E., Kayser, J., Sander, C., Böttger, D., Wong, L.Y.X., Alvarenga, J.A., Fava, M., McGrath, P.J., Deldin. P.J., Mcinnis. M.G.., Trivedi, M.H., Weissman, M.M., Pizzagalli, D.A., Hegerl, U., Bruder, G.E. (in press). Resting EEG measures of brain arousal in a multisite study of major depression. Clinical EEG & Neuroscience. Webb, C.A., Singleton, P., Bondy, E., Stanton, C.H., Pizzagalli, D.A., Auerbach, R.P. (in press). Cognitive vs. behavioral skills in CBT for depressed adolescents: Disaggregating within-patient vs. between-patient effects on symptom change. Journal of Consulting and Clinical Psychology. Whitton, A.E., Green, A.I., Pizzagalli, D.A., Roth, R.M., Williams, J.M., Brunette, M.F. (in press). Potent dopamine D2 antagonists block the reward-enhancing effects of nicotine in smokers with schizophrenia. Schizophrenia Bulletin. Whitton, A.E., Webb, C.A., Dillon, D.G., Kayser, J., Rutherford, A., Goer, F., Fava, M., McGrath, P., Weissman, M., Parsey, R., Adams, P., Trombello, J.M., Cooper, C., Deldin, P., Oquendo, M.A., McInnis, M.G., Carmody, T., Bruder, G., Trivedi, M.H., Pizzagalli, D.A. (in press). Pre-treatment rostral anterior cingulate cortex connectivity with salience network predicts depression recovery: Findings from the EMBARC randomized clinical trial. Biological Psychiatry. Liao, A., Walker, R., Carmody, T.J., Cooper, C., Shaw, M.A., Grannemann, B.D., Adams, P.A., Bruder, G.E., McInnis, M.G., Webb, C.A., Dillon, D.G., Pizzagalli, D.A., Phillips, M.L., Kurian, B.T., Fava, M., Parsey, R.V., McGrath, P.J., Weissman, M.M., Trivedi, M.H. (2019). Anxiety and anhedonia in depression: Associations with neuroticism and cognitive control. Journal of Affective Disorders, 245, 1070-1078. Davidson, R.J., Pizzagalli, D., Nitschke, J.B. (2009). The representation and regulation of emotion in depression: Perspectives from affective neuroscience. In: I. Gotlib and C. Hammen (Eds. ), Handbook of Depression (2nd edition). New York: Guilford Press, pp. 218-248. Davidson, R.J., Pizzagalli, D., Nitschke, J.B. (2002). The representation and regulation of emotion in depression: Perspectives from affective neuroscience. In: I. Gotlib and C. Hammen (Eds. ), Handbook of Depression. New York: Guilford Press, pp. 219-244. Davidson, R.J., Pizzagalli, D., Nitschke, J.B., Kalin, N.H. (2003). Parsing the subcomponents of emotion and disorders of emotion: Perspectives from affective neuroscience. In: R.J. Davidson, K.R. Scherer, H.H., Goldsmith (Eds. ), The Handbook of Affective Science. Oxford: University Press, pp. 8-24. Dillon, D. G., Pizzagalli, D.A. (2010). Maximizing positive emotions: A translational, transdiagnostic look at positive emotion regulation. In: A. M Kring and D. M. Sloan (Eds. ), Emotion Regulation and Psychopathology, Guilford Press, New York, pp. 229-252. Lehmann, D., Koenig, T., Pizzagalli, D. (1999). Gedanken und Emotionen im elektrischen Feld des Hirns. In: W. Machleidt, H. Haltenhof und P. Garlipp (Eds. ), Schizophrenie – eine affektive Erkrankung? Stuttgart: Schattauer, pp. 31-43. Pizzagalli, D.A., Dillon, D.G., Bogdan, R., Holmes, A. (2011). Reward and punishment processing in the human brain: Clues from affective neuroscience and implications for depression research. In: O. Vartanian and D. Mandel (Eds. ), Neuroscience of Decision Making. New York: Psychology Press, pp. 199-220. Pizzagalli, D.A. (2009). Anhedonia. In: D. Sander and K.R. Scherer (Eds. ), The Oxford Companion to Emotion and the Affective Sciences. New York: Oxford University Pres, p. 33. Pizzagalli, D.A., Dillon, D. G., Bogdan, R., Holmes, A. (in press). Reward and Punishment Processing in the Human Brain: Clues from Affective Neuroscience and Implications for Depression Research. In: O. Vartanian and D. Mandel (Eds. ), Neuroscience of Decision Making. Psychology Press, pp. 199-220. Pizzagalli, D., Hendrick, A.M., Horras, K.A., Davidson, R.J. (2002). Anterior cingulate theta activity is associated with degree of treatment response in major depression. In: K. Hirata, Y. Koga, K. Nagata, K. Yamazaki (Eds. ), Recent Advances in Human Brain Mapping. Proceedings of the 12th World Congress of the International Society for Brain Electromagnetic Topography (ISBET 2001). Excerpta Medica, International Congress Series 1232. Amsterdam: Elsevier Science B.V., pp. 711-7. Pizzagalli, D., Lehmann, D., Koenig, T., Regard, M., Pascual-Marqui, R. D. (2002). Face-elicited ERPs and affective attitude: Brain electrical microstate and tomography analyses. In: J.T. Cacioppo, G.G. Berntson, R. Adolphs, C.S. Carter, R.J. Davidson, M.K. McClintock, B.S. McEwen, M.J. Meaney, D.L. Schacter, E.M. Sternberg, S.S. Suomi, S.E. Taylor (Eds. ), Foundations in Social Neuroscience. Cambridge: The MIT Press, pp. 599-614. Pizzagalli, D., Koenig, T., Regard, M., Lehmann, D. (1997). Event-related potential fields and general affective style for presented face images. In: H. Witte, U. Zwiener, B. Schack and A. Doering (Eds. ), Quantitative and topological EEG and MEG analysis. Jena: Druckhaus Mayer Verlag GmbH, pp. 467-470. Pizzagalli, D.A., Treadway, M.T. (2014). Neuroimaging approaches to the study of Major Depressive Disorder: From regions to circuits. In: I.H. Gotlib, C.L. Hammen (Eds. ), Handbook of Depression, 3rd Edition. New York: Guilford, pp. 202-219. Pizzagalli, D.A., Whitton, A.E., Webb, C.A. (2018). Mood Disorders. In James N. Butcher, Jill M. Hooley (Eds.). APA Handbook of Psychopathology (Volume 1; Psychopathology: Understanding, Assessing, and Treating Adult Mental Disorders). American Psychological Association, pp. 403-427. Treves, A., Pizzagalli, D. (2002). Vigilance and perception of social stimuli: Views from ethology and social neuroscience. In: M. Bekoff, C. Allen and G. Burghardt (Eds. ), The Cognitive Animal: Empirical and Theoretical Perspectives on Animal Cognition. Cambridge: The MIT Press, pp. 463-9. Webb, C.A., Pizzagalli, D.A. (2018). Sadness and depression. In: M. Lewis, J. M. Haviland-Jones, and L.F. Barrett (Eds. ), The Handbook of Emotion, 4th Edition. New York: Guilford, pp. 859-870.